C and DSE Telangana - Rc.No.265, Dated:02.11.2017 :: Subject:- SE DEPARTMENT - MID DAY MEAL SCHEME - Implementation of Mid Day Meal Scheme - Certain instructions issued Reg. All the District Educational Officers in the State are hereby informed that the Mid Day Meal Scheme is being implemented in all the schools of Govt./Local Body/ Aided. Model Schools/ NCLP/ Madarsas for the students studying in classes I to X in the State. As per the orders of the Ciovernment the egg has lo be supplied thrice in a week to all the students under Mid Day Meal Scheme. It has brought to the notice of the undersigned that in certain schools the egg is not being supplied thrice in a week and also the menu is not being implemented. 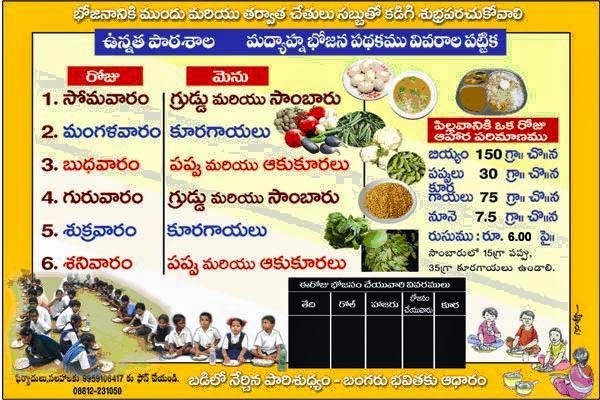 Therefore, they are hereby instructed to see that the following menu should be implemented in all the schools under Mid Day Meal Scheme and egg is being served thrice in a week. Further all the District Educational Officers are instructed to ensure that MDM bills are submitted to Treasury Office by 5th of every month for the previous month bills and payment should be made by 10th of every. month. Any slackness on implementation of Mid Day Meal Scheme will be viewed seriously. C and DSE Telangana :: Rc.No.265, Dated:13.07.2017 :: SUB: SE DEPARTMENT- MID DAY MEAL SCHEME - Implementation of Mid Day Meal Scheme - Certain instructions issued- Reg. 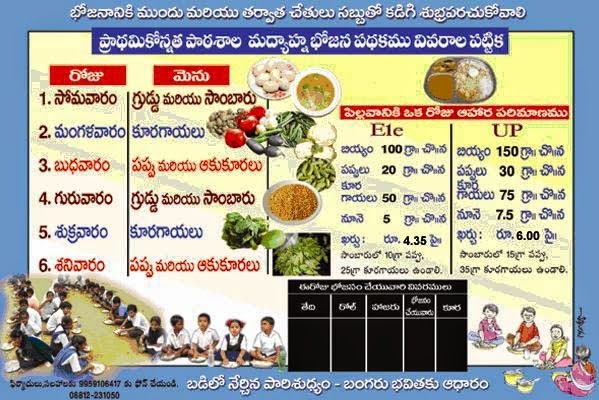 All the District Collectors I District Educational Officers in the State are hereby informed that the Mid Day Meal Scheme is being implemented in all the schools of Govt/Local Body/ Aided/ Model Schools/ NCLP/ Madarsas for the students studying in classes I to X in the State. As per the orders of the Government the egg has to be supplied thrice in a week to all the students under Mid Day Meal Scheme. It has brought to the notice of the undersigned that in certain schools the egg is not being supplied thrice in a week and also the menu is not being implemented. Therefore, they are requested to see that the following menu should be implemented in all the schools under Mid Day Meal Scheme. Further they are hereby informed to take necessary steps for supply of eggs thrice in a week in co-ordination with National Egg Co-ordination Committee (NECC) so that the main object of the Mid Day Meal Scheme shall be fulfilled in supply of nutritious food to the students. The District Purchase Committee shall fix the rates for supply of Eggs in the District within budget provision. They may contact the following Business Manager of NECC in this regard.